Article first appeared in Cutting Tool Engineering by Alan Richter. The Augusta, Maine-based company’s QC process is set in motion at the beginning of every job and remains a focus throughout production. Engineers map every checkpoint in the production process at which inspectors ensure that a machined part complies with all requirements, standards and expectations. With the help of four coordinate measuring machines, including an inline CMM on the production floor, Kennebec performs first-article and final inspections. However, Kennebec’s vision for a lean quality-inspection process includes inline and lab inspection with newer, faster CMMs and a focus on fundamentally improving how parts are fixtured. Keeping spindles running and making good parts is the goal of any manufacturer and is what drives Kennebec to eliminate its QC bottleneck. According the company, the ideal inspection process includes a CMM for every high-production work cell and CMMs for the metrology lab, all complemented by dedicated, quick-change fixtures. Faster, easier setups will increase the number of employees who can inspect components, helping to increase spindle uptime. The evolution toward in-process inspection was initiated by a high-volume, high-profile defense customer requesting that Kennebec measure production parts and submit statistical data for review vs. source inspections of parts from work cells. For the first “super cell,” Kennebec chose a Carl Zeiss Duramax CMM running Calypso software. At the same time, the company added a second Duramax to the metrology lab to complement two larger Carl Zeiss Contura CMMs. A setup on a Carl Zeiss Duramax CMM using an 18″ (457.2mm) Inspection Arsenal Loc-N-Load docking rail. A number of quick-change fixtures are secured on the docking rail and then released as needed. Image courtesy Phillips Precision. The inline CMM also runs Prolink data collection software. This provides machinists real-time feedback on product conformance, process capability and trending to enable proactive process adjustments in the cell and prevent defects and production delays. The measurement data and analysis can be sent to customers to eliminate the need for on-site source inspections. The company has experienced a 1-year payback on its work cell CMM through the reduction of bad parts and the elimination of on-site source inspections. As part of the conversion to all Carl Zeiss CMMs, every key quality team member attended metrology training offered by the dealer, Methods Machine Tool Sales Inc., Sudbury, Mass. During training, the team was introduced to the second piece of the lean QC puzzle: Inspection Arsenal Loc-N-Load interlocking, fast-swap fixture plates and clamps from Phillips Precision Inc., Boylston, Mass. The inspection staff includes a CMM programmer and two CMM operators. With more than 70 different part styles inspected per day, the ratio of inspectors and CMMs to production staff and CNC machine tools, although not uncommon, makes it impossible for QC to keep pace using traditional inspection techniques. 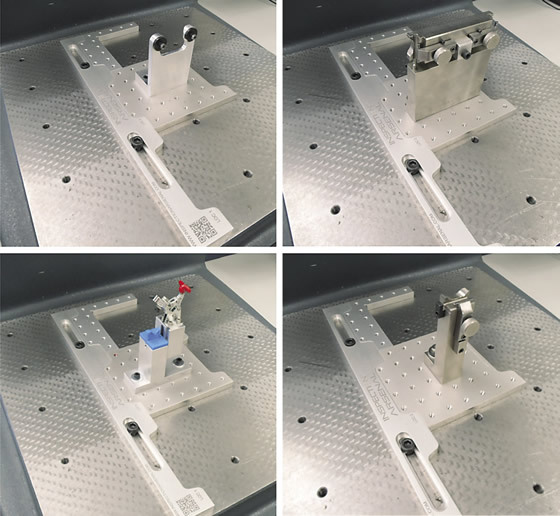 The Inspection Arsenal Loc-N-Load fixture system’s two main components easily adapt to a CMM, according to Phillips Precision. A docking rail installs outside the work area of the probe while five sizes of magnetically interlocking fixture plates are secured and released, creating repeatable setups for many of Kennebec’s parts. Trigger-action, non-marring clamps and various other workholding components complete the system. With the system, multiple fixtures can be set up on a CMM and swapped for fast access to the table when necessary, with little interruption. Fixtures can be moved from one CMM to another while maintaining accuracy. By dedicating quick-change fixtures for simple, repeatable and documented steps, inspection work can be standardized. 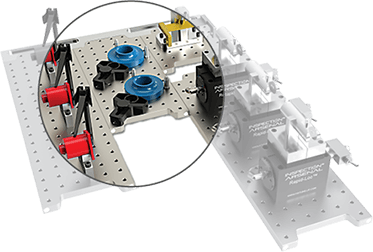 As part of its lean focus, Kennebec made this fixture system the standard, thereby reducing fixture and training costs and allowing production personnel to inspect parts. All of the CMMs in the metrology lab accept Loc-N-Load fixture plates, allowing inspectors to move seamlessly between CMMs. Bump projects more than $100,000 in savings this year as more parts are checked with the fixture plates. CUTTING TOOL ENGINEERING Magazine is protected under U.S. and international copyright laws. Before reproducing anything from this Web site, call the Copyright Clearance Center Inc. at (978) 750-8400.